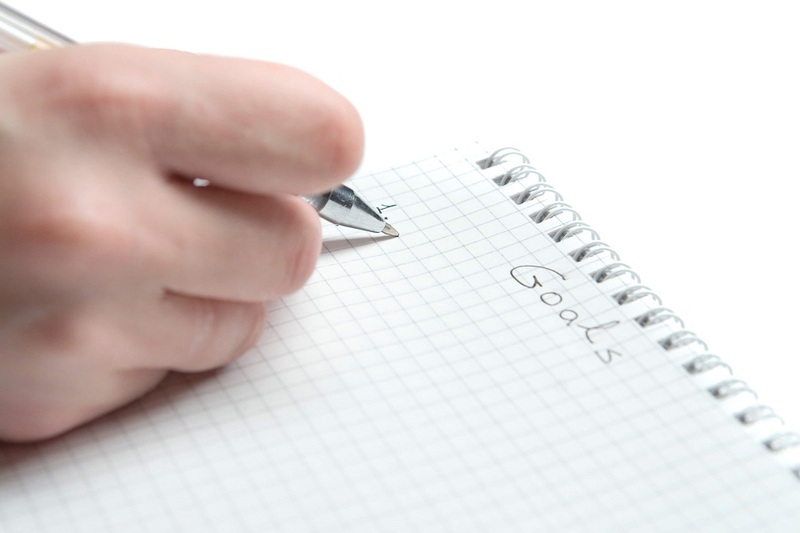 Use this goal setting worksheet to turn pie in the sky goals into reality in real time. Knowing what to chase, having the great idea, dreaming big…getting your ideas down to the important few. These are the essential first steps to achievement. However, many dreams and goals get no further than this! The challenge is to map out all the chunks of activity that need to be completed to arrive at the achievement of your goal. It is rather like planning a road trip and plotting the stops, the refueling, the meal options and sights to see. We break the trip into manageable pieces so that we can rest, reconsider and recalibrate – taking into account changing conditions along the way. As discussed in the previous article How to Achieve Goals: When Focusing On Less Means More, nominating 1-3 key goals over a quarterly or 12 weekly approach gives us a line of sight that we can manage. Not so far away that the path is impossible to envisage – not so close that we are uncertain as to what we should do next. Projecting your daily hours across a 12-week plan means that you don’t over promise and under deliver to yourself or others. Consider your top 1-3 priorities over the next 12 weeks – these are the activities that will give you biggest bang for buck for your effort; the greatest financial, strategic, personal or professional relationship impact, the greatest satisfaction or reward. Now imagine your destination point – describe the state of achievement at the end of the 12 weeks…Specifically! How many calls, clients, sales, meetings, written pages will be dealt with? What stages of completion will be reached at this end point…? Be realistic…you will have a chance to check in regularly to monitor progress. The common goal setting mistake that we make (yes, I have committed it many times) is that we set a deadline but not a schedule. In step 2 you want to allocate in real time the way you will spend your days. Build a schedule for completion. How many hours per week will you need to spend to get to where you have planned? Will some weeks require more dedicated hours than others as projects approach completion or other points of intensity? 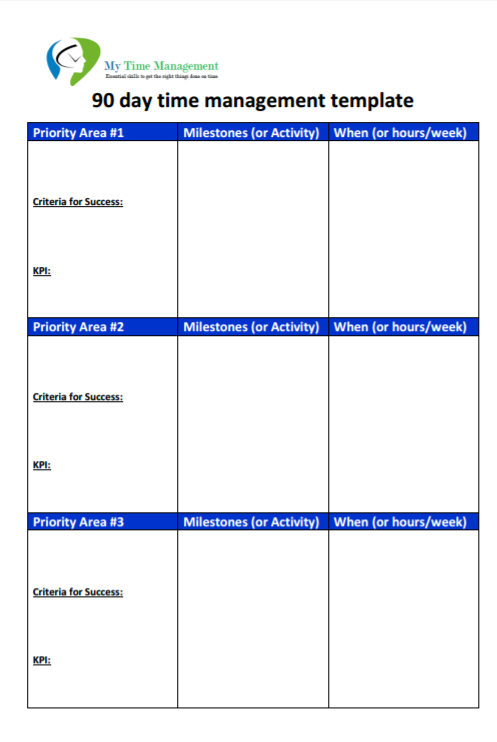 You can use our 90-day Time Management Template (PDF) to form your quarterly road map and follow up by creating sessions in your calendar to commit your real hours. Avoid damage to your reputation and your self-esteem by making sure you translate your intentions into value that you can feel proud of…Measuring out the time you need and nailing your achievement in the given time brings not only success but the comfortable feeling of knowing you are reliable and really can do what you say you can do. How can you use this with your team? Sometimes when I work with companies the team is not clear on what they are aiming to achieve in the next 90 days or how they are going to do it. What you can do is have a team meeting and have each person in your team fill out this 90 day goal setting worksheet and the actions that support each goal. It allows each member of the team to get agreement with the manager on what are those things that they should be focusing on. It allows the team to build their individual goals off the back of the team goals - which creates alignment. Take the time NOW to write down who you want to be in 90 days time.